Edith Nourse was born in Saco, Maine, on March 19, 1881. She was one of two children born to Franklin T. Nourse, an affluent textile plant magnate, and Edith Frances Riversmith.2 She received a private school education at Rogers Hall School in Lowell, Massachusetts, and finished her education abroad in Paris, France. Returning to America in 1907, she married John Jacob Rogers, a Harvard–trained lawyer. The couple was childless and settled in Lowell, Massachusetts. In 1912, John Rogers was elected as a Republican to the 63rd Congress (1913–1915) and was successfully re–elected to the House for six succeeding terms. He eventually served as Ranking Majority Member on the Foreign Affairs Committee and authored the 1924 Rogers Act, which reorganized and modernized the U.S. diplomatic corps.3 During World War I, Edith Nourse Rogers inspected field hospitals with the Women’s Overseas Service League. “No one could see the wounded and dying as I saw them and not be moved to do all in his or her power to help,” she recalled.4 In 1918 she joined the American Red Cross volunteer group in Washington, D.C. Her work with hospitalized veterans earned her the epithet the “Angel of Walter Reed Hospital.”5 When the war was over, three Presidents—Warren Harding, Calvin Coolidge, and Herbert Hoover—appointed Rogers as their personal ombudsman for communicating with disabled veterans. She also continued to work in her husband’s congressional offices in Lowell and Washington. The Congressman considered his wife his chief adviser on policies and campaign strategy.6 Their home on 16th Street in northwest Washington became a fashionable salon where the Rogers entertained powerful politicians and foreign dignitaries. When Rogers was sworn into the 69th Congress (1925–1927), she did not receive any of her husband’s former committee appointments, which included Foreign Affairs and the powerful Appropriations panel. Instead, she received middling committee assignments: Expenditures in the Navy Department, Industrial Arts and Expositions, Woman Suffrage, and World War Veterans’ Legislation (later renamed Veterans’ Affairs). In the 70th Congress (1927–1929), she dropped the first three committees and won seats on the Civil Service and Indian Affairs panels (she stayed on the latter for only one term). In the 73rd Congress (1933–1935), Rogers won back her husband’s seat on the more coveted Foreign Affairs Committee.16 Her concern with veterans’ issues went hand–in–hand with her interest in foreign affairs. Well–traveled and attuned to international affairs, Rogers seemed a natural appointment to that panel. Soon after taking her seat, Rogers began to address the dangers of fascism in Nazi Germany and in Italy. She was one of the first Members of Congress to denounce Nazi racial policies. In 1937 she broke with fellow Republicans to vote against the Neutrality Act, which had won wide support from GOP isolationists. In 1939, Rogers and Democratic Senator Robert Wagner of New York cosponsored a measure to increase the quota for Jewish immigrants in an effort to rescue Jewish refugee children fleeing Nazi persecution. In 1940, she again crossed party lines to vote for the Selective Service Act—creating the nation’s first peacetime draft. Rogers eventually rose to the number two Ranking Minority Member post on the Foreign Affairs Committee before she voluntarily retired from it in late 1946, when the Legislative Reorganization Act reduced the number of committee assignments a Member could hold. Congresswoman Rogers’s crowning legislative achievements came during World War II and in the immediate postwar years. In May 1941, Rogers introduced the Women’s Army Auxiliary Corps Act, to create a voluntary enrollment program for women to join the U.S. Army in a noncombat capacity. Her proposal, she explained to colleagues, “gives women a chance to volunteer to serve their country in a patriotic way,” as medical care professionals, welfare workers, clerical workers, cooks, messengers, military postal employees, chauffeurs, and telephone and telegraph operators, and in hundreds of other capacities.19 On May 14, 1942, the WAAC Act was signed into law, creating a corps of up to 150,000 women for noncombatant service with the U.S. Army. A year later that measure was supplanted by Rogers’s Women’s Army Corps Bill, which granted official military status to the volunteers by creating the Women’s Army Corps (WAC) within the Army. Rogers’s success opened the way for other uniformed women’s services in the Navy (WAVEs) and the Air Force (WASPs). Congresswoman Rogers, who had witnessed some of the difficulties of post–World War I demobilization and its effects on veterans, sought to ease that transition by putting in place programs to assist servicemen and women who would soon return from Europe and the Pacific. As the Ranking Minority Member of the World War Veterans Legislation Committee, she sponsored a package of measures, later dubbed the GI Bill of Rights, which passed the House in 1944. Among the chief provisions of the legislation were tuition benefits for college–bound veterans and low–interest home mortgage loans. During the 82nd Congress (1951–1953), Rogers spearheaded the Veterans Re–adjustment Assistance Act of 1952, which extended the GI Bill provisions to Korean War veterans.20 Late in the war, Rogers also proposed the creation of a Cabinet–level Department of Veterans Affairs. The proposal was not adopted in her lifetime but eventually came to fruition in 1989. So beloved by veterans was Rogers that the American Legion conferred upon her its Distinguished Service Cross—making her the first woman to receive the award. Rogers’s intense patriotism and conservative ideology led her to embrace postwar anticommunism. In the early years of the Cold War, she feared the potential insurgency of communism in the United States, making public addresses and floor speeches on the subject.21 She supported the investigations of the House Committee on Un–American Activities and the loyalty program undertaken by President Harry S. Truman’s administration. She later supported the initial investigations conducted by Republican Senator Joseph McCarthy of Wisconsin. Her concern about the influence of the “red menace” extended to international organizations. Though she supported the creation of the United Nations, Rogers advocated in 1953 that if China were admitted to the U.N. that the U.S. should withdraw from the organization and evict the organization’s headquarters from New York City. 1Phil Casey, “Rep. Edith Rogers, 79, Dies; Served in House 35 Years,” 11 September 1960, Washington Post: B12. 2Rudolf Engelbarts, Women in the United States Congress, 1917–1972 (Littleton, CO: Libraries Unlimited, 1974): 33. 3“John Jacob Rogers, Bay State Member of Congress, Dead,” 29 March 1925, Washington Post: 1; “A Friend of the Foreign Service,” 31 March 1925, New York Times: 18. 4Frances Mangum, “Congresswoman Good Friend to War Veterans,” 23 January 1934, Washington Post: 11. 5Elisabeth Ellicott Poe,“’Angel of Walter Reed’ to Return to Washington as Congresswoman,” 12 July 1925, Washington Post: SM1. 6“Mrs. Rogers Seeking Election to Congress on Service Goal,” 26 June 1925, Christian Science Monitor: 5. 7“J.J. Rogers’ Widow Seeks His House Seat,” 8 April 1925, Washington Post: 3. 8“Election of Mrs. Rogers Wins Praise of State Dry League,” 1 July 1925, Christian Science Monitor: 7; “J.J. Rogers’ Widow Nominated for House,” 17 June 1925, Washington Post: 1; “House Election Primaries Near,” 10 June 1925, Christian Science Monitor: 5. 10“Women Office Holders Are Now Coming From the Home,” 12 July 1925, New York Times: X3. 11Special election statistics from Michael J. Dubin et al., U.S. Congressional Elections, 1788 to 1997 (Jefferson, NC: McFarland & Company, Publishers Inc., 1998): 458; “Mrs. Rogers Beats Foss by Two–to–One Vote In Bay State Election for Representative,” 1 July 1925, New York Times: 1; “Mrs. Rogers Wins Election to House,” 1 July 1925, Washington Post: 1. 14Annabel Paxton, Women in Congress (Richmond, VA: Dietz Press, 1945): 46; “Would Dress Up Soldiers and Aid Manufacturers,” 20 June 1929, New York Times: 22; “Women House Members End Session With Achievement,” 28 February 1931, Washington Post: 8; “Mrs. Rogers Seeks Tariff Findings on Japanese Textiles,” 22 December 1936, Christian Science Monitor: 9. 15“House Hails ‘First G.O.P. Lady,’” 1 July 1950, New York Times: 8. 16David T. Canon et al., Committees in the U.S. Congress, 1789–1946, vol. 3 (Washington, D.C.: Congressional Quarterly Press, 2002): 894. Based on Charles Stewart’s relative rankings in “Committee Hierarchies in the Modernizing House, 1875–1947,” American Journal of Political Science 36 (No. 4, November 1992): 835–856. 17Brown, “Edith Nourse Rogers,” ANB; “Offers Revisions in Veterans’ Care: Mrs. Rogers Suggests Nursing and Physicians Corps as a Permanent Adjunct,” 27 August 1943, New York Times: 14. 18“Veteran’s Tribute to Representative Edith Nourse Rogers,” 15 May 1930, Washington Post: 6; Hope Chamberlin, A Minority of Members: Women in the U.S. Congress (New York: Praeger, 1973): 59. 19Congressional Record, House, 77th Cong., 1st sess. (28 May 1941): 4531–4533; Congressional Record, House, 77th Cong., 1st sess. (12 December 1941): 9747. 20In the 60 years after passage of the original GI Bill of Rights, more than 21 million veterans and servicemen received $75 billion in benefits for education and job training. The Veterans’ Administration and Department of Veterans’ Affairs also had guaranteed nearly 17 million home loans since the program’s inception. Department of Veterans Affairs, “Fact Sheet: Facts About the Department of Veterans Affairs,” (April 2003). 21“Rep. Edith Rogers Seeks Loans for Homeless G.I.’s,” 6 November 1947, Los Angeles Times: 11; see also, Congressional Record, House, 80th Cong., 1st sess. (27 March 1947): 2785–2786. 22Chamberlin, A Minority of Members: 61. Papers: 1926-1935, 1 folder. Letters from Edith Nourse Rogers to various constituents discussing the Grant memorial, labor issues such as the 30 hour work week, and various bills pending in Congress. Papers: 1854-1961, 11 linear feet. The papers include correspondence Edith Nourse Rogers received as chairman of the Committee on Veterans Affairs. Also includes correspondence constituents, speeches, campaign material, memorabilia, recordings, motion picture film, photographs, newspaper clippings, and sympathy letters concerning her death. Scrapbooks are available on microfilm. A finding aid is available in the repository. Papers: In the Pluma Burroughs Penton Batten Papers, 1950-1956, 5.25 linear feet. Subjects covered include Edith Nourse Rogers. An unpublished finding aid is available in the repository. Papers: In the Consumers' League of Massachusetts Records, 1891-1955, 13 linear feet. Subjects covered include Edith Nourse Rogers. Papers: In the Elizabeth Lowell Putnam Papers, 1887-1935, 15.5 linear feet. Subjects covered include Edith Nourse Rogers. An unpublished finding aid is available in the repository. Papers: In the Edna Lamprey Stantial Papers, 1836-1958, 1 linear foot. Subjects covered include Edith Nourse Rogers. Papers: In the William H. Benjamin Papers, 1935-1936, 86 items. Subjects covered include Edith Nourse Rogers. 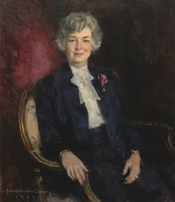 "Edith Nourse Rogers" in Women in Congress, 1917-2006. Prepared under the direction of the Committee on House Administration by the Office of History & Preservation, U.S. House of Representatives. Washington: Government Printing Office, 2006. United States. 86th Cong., 2d sess., 1960. Memorial services held in the House of Representatives and Senate of the United States, together with remarks presented in eulogy of Edith Nourse Rogers, late a Representative from Massachusetts. Washington: Government Printing Office, 1961.